Sunday May the 8th is Mother’s Day in Australia, the day we all take time to show our appreciation for our mothers. Family gatherings are held, hugs and laughs are had, and thank you gifts are often given to ensure our Mum’s know how much they are loved and that their hard work and sacrifices are never forgotten. Traditionally chrysanthemum flowers are often given to Mums as a gift, partially because they end in Mum and also because they are in season in May here in Australia. At Code Bloom we have taken the hard work out of finding the perfect gift. Our gift store and florist has so many options we’ve compiled these in a handy Mother’s Day Gift guide. 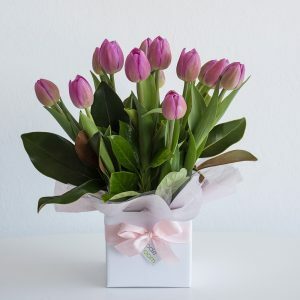 FLOWERS – for pick up, or flowers for same day delivery in Perth suburbs. Bouquets of flowers are always the most popular gift. These can be made up to order – to suit each Mother’s flowers preference, style and favourite colours. Our helpful florists are more than happy to talk you through these options in person, or via phone or email. For Mother’s Day flower deliveries in Perth we are available for Saturday or Sunday morning deliveries for pre bookings. Most popular flowers would be our Tulip Delight or Dusky Romantica. Pre orders are essential to ensure flower availability. A Code Bloom hampers speciality, we love getting phonecalls for personalised hampers. We make the most divine hampers that anyone would be thrilled to receive. Gorgeous flowers in a box arrangement can be complemented with items of your choice. You simply tell us the budget, and a bit about the recipient’s likes/dislikes and any particular hobbies or interests. Common hamper requests are – gardener based hampers, beauty product hampers, sweet and savoury hampers, wine, champagne and chocolate hampers. The list is endless! Code Bloom stocks a range of candles including Glasshouse Fragrances, Urban Rituelle and Mrs Darcy candles. The range of scents vary from mild and misty to strong and commanding of any room. We are on hand to offer guidance as to what might suit! Our Glasshouse range is available for purchase online here for delivery to Perth suburbs. Other items available at Code Bloom include a beautiful selection of scarves, a treasure trove of jewellery, photo frames, vases, handbags, clutches and other knick knacks. We guarantee a trip to our gift store in Mt Hawthorn will find a perfect gift for your Mum. Complimentary gift wrapping is also included with any purchase.